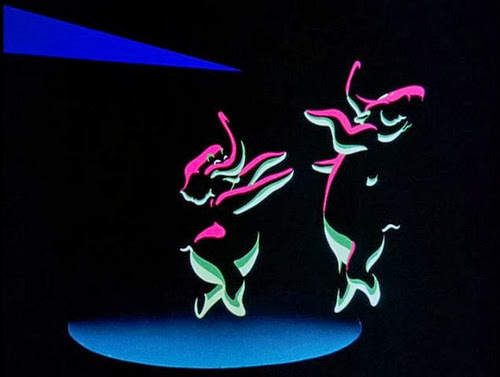 While Walt Disney did not invent animation, he perfected it, introducing new ideas and techniques that would come to define the medium and change it forever. 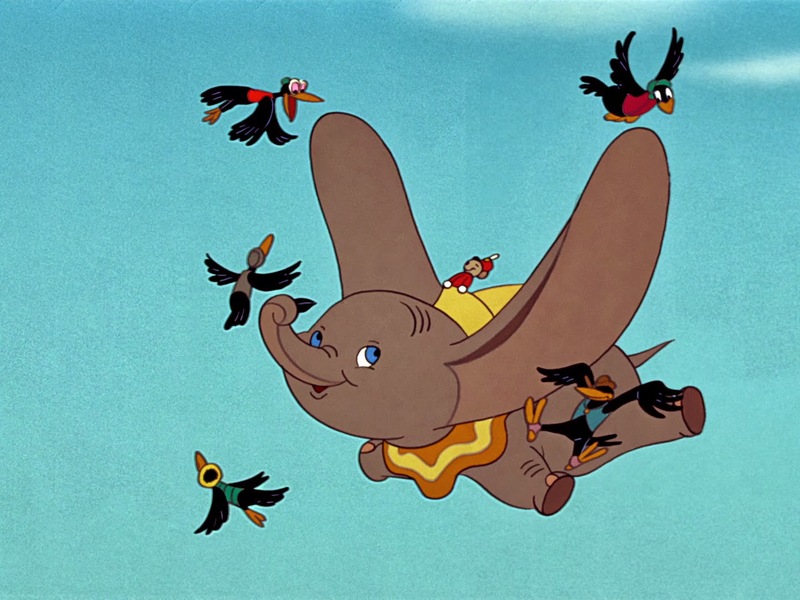 His Dumbo, released in 1941, benefits from all of the artist’s hallmarks; an enchanting, endearing story filled with pathos and humor, it commands emotional involvement, and often masks its supreme, superb style through the spirit, sentiment, and simplicity of its subject. Dumbo is a study in original, inventive use of shadows, darkness, and light, as well as excellent, expressive use of nuances and shades of color to create realistic textures, subtleties of highlights and perspective (including angles of near-avant-garde obliqueness), and complex, moving backgrounds. Outstanding in both content and execution, Disney’s fourth feature might not boast the ambition of the preceding Snow White, Pinocchio or Fantasia, but it is no less accomplished. By the early forties, Disney and his gaggle of extremely talented artists had mastered the dynamics of movement and the art of developing character personality. Returning to anthropomorphism and personification, deceptively “simple” animal characterization, Disney endows his characters as well as inanimate objects and machinery—like the circus train engine, who flexes and puffs sighs of relief after every exertion—with human features and characteristics that seem completely natural. The titular pachyderm, with rounded, pin-cushiony shapes, soft, sincere blue eyes and ears the size of bed sheets, is instantly recognizable and lovable, and the film becomes an unpretentious expression of universal human truths. 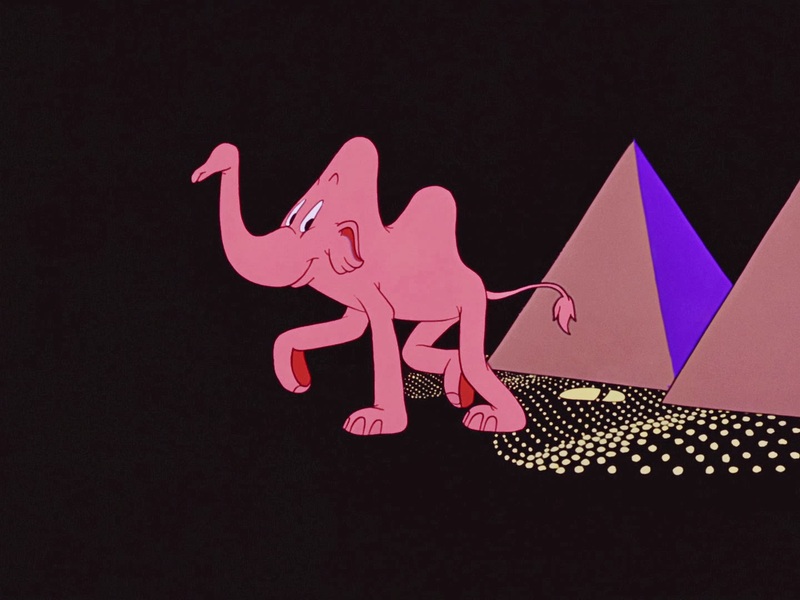 One of the sequences that set the movie apart from anything that came before it, however, is the unique, unforgettable “Pink Elephants on Parade,” one of the best known, and strangest, animated sequences that Disney, or any studio, has ever done. At the beginning of this section, Dumbo and Timothy Mouse are pleasantly tipsy on champagne-spiked water. Dumbo starts blowing bubbles of different shapes and sizes. One bubble suddenly and inexplicably transmutes into an elephant and turns pink, then proceeds to blow another pink elephant bubble from its trunk. 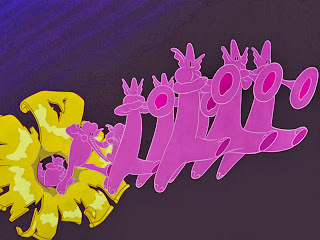 The second blows a third, and now we see four pink elephants. The trunks become trumpets and the elephants a fanfare chorus. That drags us into the grotesque: they merge their trunks and the merged bell expands, bursts, and becomes a portal for a parade of marching elephants. 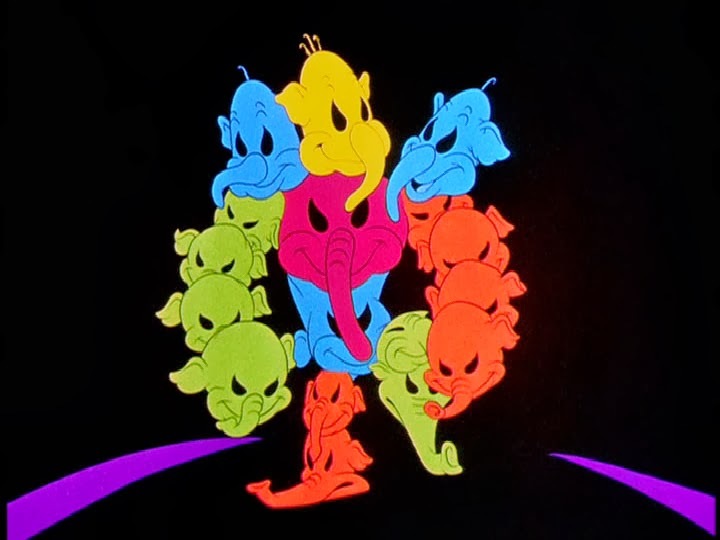 Each participating pachyderm is playing a different instrument, each a deformed part of its body, perhaps a reference to Dumbo’s overscaled ears. Elephants step over other elephants, stomp on each other, expand and deflate like balloons. 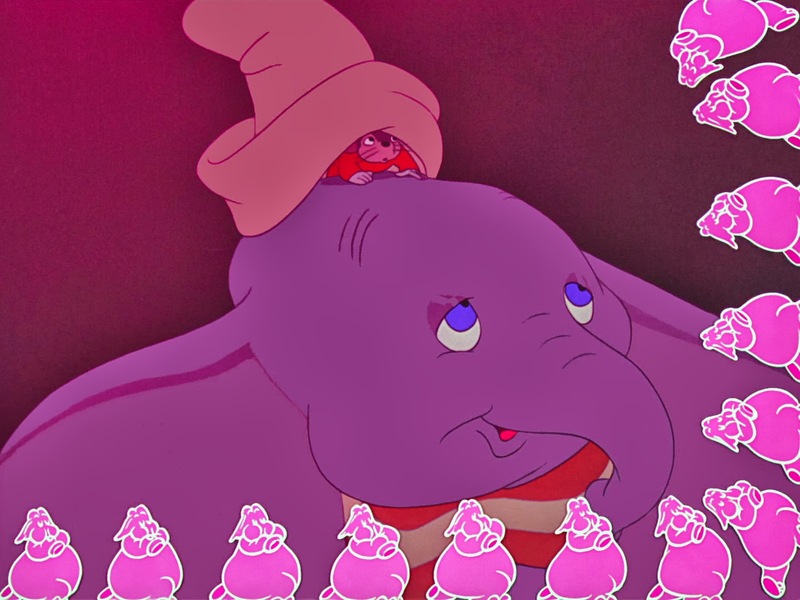 The next shot directly breaks the fourth wall, as a parade of tiny Technicolor elephants march across the edges of the frame—there is no structure in the film space itself supporting them—with Dumbo and Timothy watching. This kind of trickery had never been used in animation before; Disney’s self-conscious tampering with and letting the audience in on the illusion of the medium brings Winsor McCay to mind as a possible influence. A flood of elephants of various shades of pink subsequently fill the screen. For the first time in the sequence, the music incorporates lyrics, which are almost as scary as the images that accompany them. A lone animal on a bed—with wheels on the bottom—is surrounded by floating elephants. Is this an institutional bed in an insane asylum or hospital? What follows is a series of visual gags that play with shape, color, and the audience’s potential for epileptic seizures. Slithering, wormlike elephant trunks (with faces) merge along with stretching bodies, becoming one, explosive, brightly-hued distortion of reality, culminating in a walking, supremely creepy creature constituted of multi-colored, angry-looking elephant heads. The camera zooms in on eyes that transform into a pair of pyramids, and the sequence changes into a surrealist Oriental fantasy, complete with slinky exotic music. A cross between an elephant and a camel appears, changes into a cobra and then a belly dancer who turns into the sun, which in turn turns into an eye. A swooning, ice-skating dance set to a fast waltz follows. As the pair of elephants begin to sky, the sequence becomes more light-hearted. These are leisure activities, carried out in a social world. We have moved away from a threatening, dark universe (perhaps a stand-in for the circus, where Dumbo and his mother have been mistreated and ostracized) to an environment of fun and fantasy (the crows’ welcoming world in the sky?). 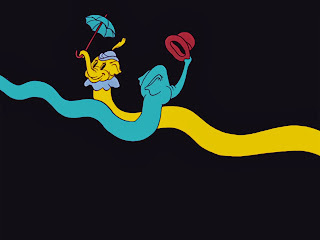 Once again we see the personifications of machines, as the elephants become cars, trains, planes and toboggans, all whizzing by at dizzying speeds through empty space. This final section rattles into a cacophony of sound and movement, exploding and tumbling in on itself. The music choices and transitions in the sequence are striking and original, a twisted cocktail of blues, waltz, jazz, Oriental tunes, bossanova and a particularly memorable electrifying merengue. All of the musical elements, however, are distorted and played at such speeds that settling in on a certain mood is like trying to grab the champagne bubbles themselves. But is there any purpose to this dizzying, dazzling waking kaleidoscopic nightmare? Is it possible that this surrealistic saturnalia of chaos has served a dramatic function? By its end, the circus has been wiped from our minds, and Dumbo and Timothy are hungover, but at peace. The difference between the early environment, filled with gossipy old maids, nasty, heartless clowns, and disinterested animals, and the tree the flying baby elephant finds himself in is not merely one of geography, but an imaginative and mental transition, perhaps one that is reflected through the evolution of the surrealist sequence. The circus is not depicted as a world of fantasy and fun; it causes suffering and isolation. The crows, in contrast, initially ridicule Dumbo but, put right by “Reverend Rodent,” end up sympathizing with and helping him gain his wings. The world of the tree, and of the crows, is opposite to that of the circus; it’s in this world that Dumbo gets a new start in life. 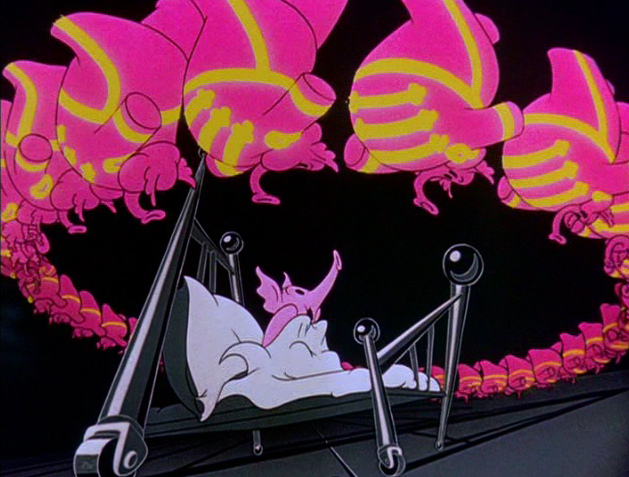 The pink elephants create a marked transition, interrupting the flow of the film and demarcating the different sections preceding and following it. Presenting a jarring change in tone in a winsome, warm children’s tale, the sequence is unforgettable for its incredible inventiveness; it becomes a lucid dream, a psychedelic visual poem of colors, shapes and sounds. 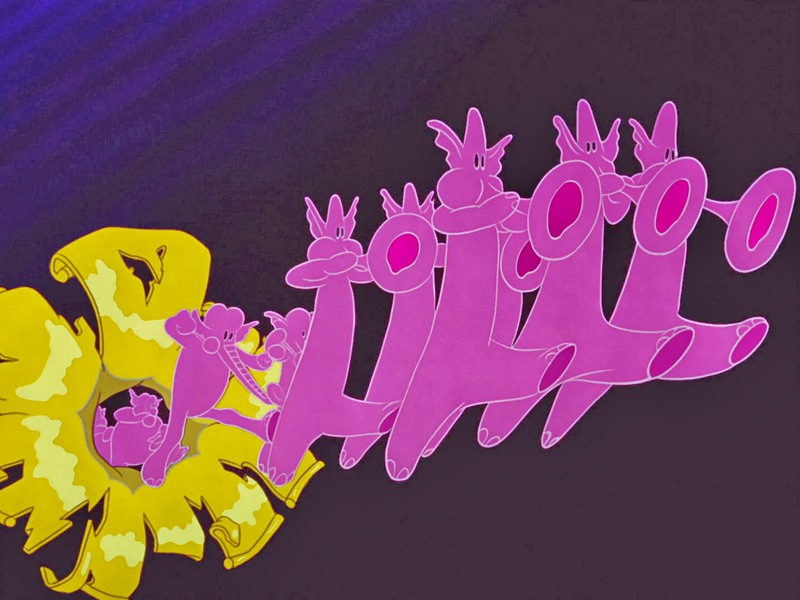 Nothing like this had ever been attempted by Disney—or any other animator—before. And while one can argue it did not advance the story in any way, its contributions to the genre are impossible to overlook. “Pink Elephants on Parade” would become the inspiration for later Disney shorts, including Der Fuehrer’s Face and Plutopia as well as fantastical and fantastic segments in features such as The Three Caballeros, Melody Time, and Alice in Wonderland. 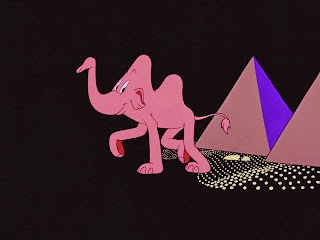 “I been done seen about everything when I see and elephant fly,” the crows of Dumbo sing; well, I been done seen about everything when I see drunken elephant hallucinations.